While installing and configuring ESXi 6.0 hasn't changed much since 5.5, that VCSA sure as heck has changed a lot. In mostly very good ways, making it a much stronger contender for the enterprise. And a faster performer for the home lab, especially when run off an SSD based local datastore. But that deployment and initial configuration process, wow, it's so completely new. If all you want is an easy install of the VCSA appliance, easy peasy, just walk right through the new html based install wizard, and type in IPs for your ESXi and vCenter. Done, and about the same level of difficulty as prior versions. All demonstrated at TinkerTry right here. But what if what you really want is what I wanted for my home lab, that is, nice friendly names instead of ugly IP addresses, which are seen all over the GUI. Like calling my ESXi 6.0 hypervisor something creative like esxi, skipping the boring names like stormtrooper or belieber. And your vCenter Server Appliance? Why, that's vcenter. Sure makes for more logical screenshots. So, if the OCD in you prefers logical names (remember Spock? ), well, you have some prerequisites to handle first. What about using a "real" DNS server, with forward and reverse lookups, and FQDN (Fully Qualified Domain Name) capabilities. See vSphere DNS Requirements, which could be met by something like a Linux server, or a Windows Server. 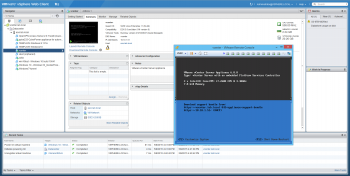 Physical, or a VM you'd autostart with your ESXi. Do I really want, or need, one of those? I prefer the KISS approach, wherever possible, especially when the goal is low maintenance. Yes, an unfortunate side-effect of the new more-capable VCSA is that installing and configuring it for your home lab has gotten more complex. One reason is that it sure doesn't like it much when you rename it after deployment. Re-issuing certs is just a piece of the clean-up, and that clean-up can sure go sideways, fast. Next. Another approach would be a scripted install involving manual edits of json files for all those networking details. But that seemed like a rather strange and intimidating way for me to introduce a newbie to the wonders of having their very own virtualization lab in their home, having to roll up their sleeves and get into script debugging. A GUI for the install tends to be much preferred, especially because this is typically a small environment your setting up here. If you go the route of a dedicated server for your home's DNS and/or DHCP duties, that could also mean downtime for your family, when you're inevitably tinkering with your vSphere environment. Use your WiFi Router's DNS/DHCP? Yes! What about using the WiFi Router you already have? That's the approach I took, and something similar might work for in your home. This approach is admittedly a gamble, and not something I could test on other routers. But boy, the pay-off for the temporary router tweaks to feed your VCSA appliance just the right DNS/DHCP stuff for the initial configuration is rather sweet. The fruits of those labors are seen pictured at right. Nice thing is that I don't have to fill out change control documentation that my family would have to sign off on, for any little change I want to make to my ESXi host, including unscheduled shutdowns for my inevitable hardware tinkering. Please read the caveats/disclaimers before you begin to follow-along with the video, to be sure this router-tweak method is the approach for you. Awesome. 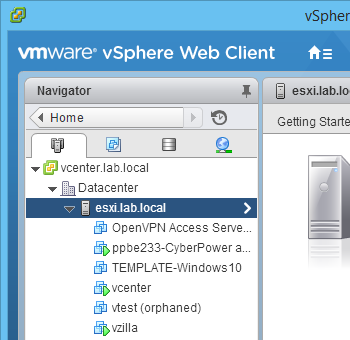 I loved the last video you did and it helped setup my lab to get my VCP. It's about time for me to start studying to renew so I'm glad to have another great resource. Thanks so much for doing these. I hope Chris enjoys similar success by following this new video, intended to help folks get a fresh install of vSphere 6.0 configured. I'll admit only time will tell if other folks routers can perform similarly, because checking out various instruction manuals didn't really tell me what I needed to know. Let us all know, drop a comment below!